Researchers from the University of Birmingham, UK, and University of Tübingen, Germany, looked for the spontaneous re-occurrence of a tool-use behaviour practiced in wild chimpanzees where sticks are used to 'scoop' algae from the top of water surfaces. 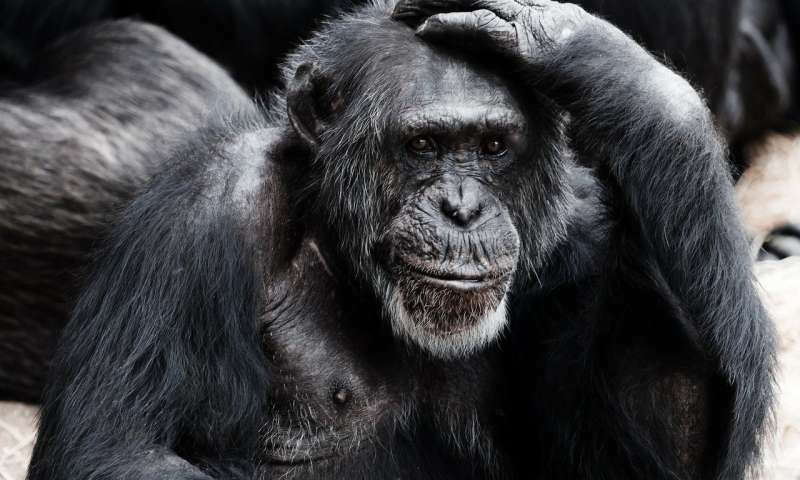 The results challenge the accepted belief that chimpanzees need to learn from each other how to use tools, and instead suggest that some (if not all) forms of tool-use are instead within their pre-existing behavioural repertoire (what the authors call "latent solutions"). Elisa Bandini explained, "The commonly held belief is that chimpanzee behaviour is cultural, much like how human culture has been passed between groups. But if that was the case, the same behaviours should never re-occur in naïve subjects. Nobody, for example, could accurately reinvent extinct languages on the spot." Dr Claudio Tennie added, "Given these results, the long-held assumption that apes must observe one another in order to show these behaviours may have been due to an illusion of cultural transmission - created by the apes arriving at the same behaviour independently." The University of Birmingham and Twycross Zoo has a Memorandum of Understanding (MoU), which promotes teaching, research and other activities for the mutual benefit of both parties. This research was conducted under the MoU agreement, using Twycross' extensive history with, and in caring for, primates.